Xenon is a noble gas. The element has atomic number 54 and element symbol Xe. Like all the noble gases, xenon is not very reactive, yet it has been known to form chemical compounds. 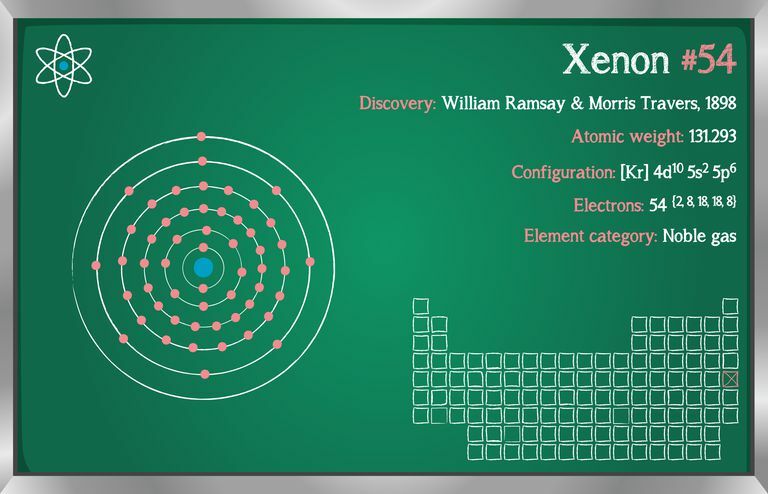 Here is a collection of xenon facts, including the element's atomic data and properties. Isotopes: Natural xenon consists of a mixture of nine stable isotopes. An additional 20 unstable isotopes have been identified. Properties: Xenon is a noble or inert gas. However, xenon and other zero valance elements do form compounds. Although xenon is not toxic, its compounds are highly toxic due to their strong oxidizing characteristics. Some xenon compounds are colored. Metallic xenon has been produced. Excited xenon in a vacuum tube glows blue. Xenon is one of the heaviest gases; one liter of xenon weighs 5.842 grams. Uses: Xenon gas is used in electron tubes, bactericidal lamps, strobe lamps, and lamps used to excite ruby lasers. Xenon is used in applications where a high molecular weight gas is needed. The perxenates are used in analytical chemistry as oxidizing agents. Xenon-133 is useful as a radioisotope. Sources: Xenon is found in the atmosphere at levels of approximately one part in twenty million. It is commercially obtained by extraction from liquid air. Xenon-133 and xenon-135 are produced by neutron irradiation in air cooled nuclear reactors.